i love these photos! i like the angle of the second photo, but i really like the contrast in the first! good stuff! I love these black and white shots and the perspective on both photos. Those little flowers look really lovely! I am taking this opportunity to say that I do appreciate your nice and friendly comments on my blog. Thank you! I love paper whites!! And I loveeyour windowsill. Lovely light! Gorgeous! love your paper whites. they have such a wonderful, unique smell don't you think? 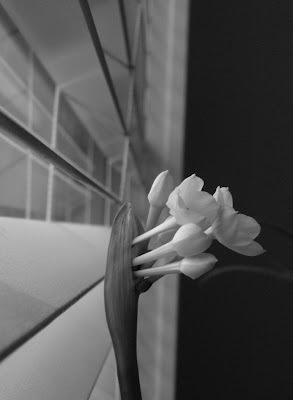 I love the black and white with these paper whites..beautiful.. I can almost catch the sweet scent of those silly flowers; they smell like the home on a winter day to me. Such beautiful shots! I am so taken with b & w's. love that you used B&W tones for these shots...and I love the thought that its more tomorrow. and...just thank you for a special boost today. Beautiful black and whites, I love paper whites , so simple and such a beautiful fragrance! Love these black and whites! And thanks for stopping by my blog. I'm sure I'll be swinging by here more in the future! love the b&ws. I grew an amaryllis one year and it was so fun to watch it blooming from the bulb. Thanks for visiting, now I am able to see your unique outlook on life. Such an interesting blog. Oh *wow* these seem so virginial... so pure... delicately beautiful. 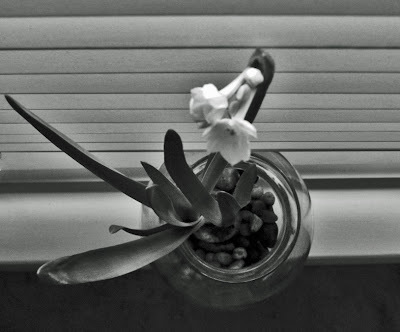 I love paperwhites. Mine have yet to bloom in the gardens, but I saw buds on the tender fronds just today. Soon I will inhale the heavenly fragrance once again. mine has just died off.it brought me so much joy. it was perched on my kitchen windowsill. i would drink my tea and just stare at it. how are you, ELK? i have not been here in a while, and i miss your lovely pictures. thank you for your well-thought out comment on my transparency post. everyone's input was very helpful and insightful. So pretty! And the black and white is perfect for these shots.